This essence contains all of the main ingredients of Absinthe – aniseed, star anise oils and wormwood oil – with a whole new taste and experience reflecting it’s beautiful green colour similar to the Absinthe Classic. More information in’Description’ below. 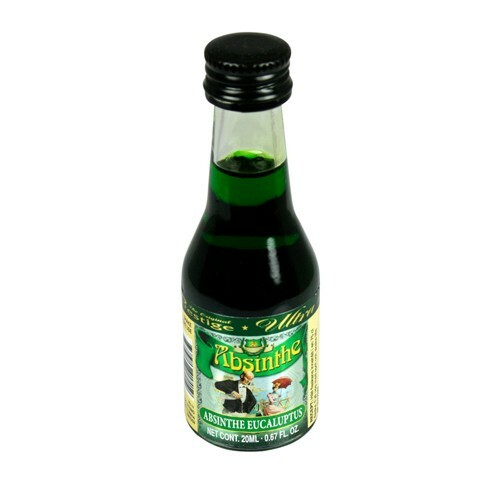 Natural herbs and herb oils balanced to perfection with the Eucalyptus oil makes this Absinthe taste extremely satisfying if you enjoy both Absinthe and the taste of Eucalyptus. A minimum strength alcohol 60 – 70% is recommended to enable the herb oils to dissolve. Mix the 20ml of essences with 750ml of neutral spirits for best results, givin a thujone content of 35mg. OPTIONAL – add 75 gms of granulated sugar for a smoother taste.